Logo ideas back with Chrissie last night, and the domain name www.lecolycarpfishing.com is all done. The web site is up in its basic form. First logo ideas sent over by Chrissie and they’re great. Tom and I will make a decision on that tonight. As I said before I am so pleased that I have Chrissie sorting the web basics for us. I would not have the time or maybe the inclination to teach myself and do the programming using new software. Hard manual work during the day makes it very difficult to then come home and sit in front of the laptop. Perhaps I’ll get used to it!!!!!!! Tom and I had previously discussed names for our lake and done some research. We wanted a name that was a good fit with the area and in French. After all we are in France!!!! After a few nights research we decided on Le Coly. No strange or rude meaning in French and the name is local to the area as it is a tributary of the Dordogne. Also it was unique to our carp fishery and of course we like it!!!???? Now back to the problem in hand. Very lucky with the weather again. Another gorgeous day!!!! Down to the lake with Tom’s axle stands and jack. We are determined to get the digger sorted and safely on the bank. When we arrive Jean Pierre was busy with Michel on the land above the lake. He immediately came over to see us. We had a quick chat about the digger situation and he reminded us that his friend would be here to help in the afternoon. 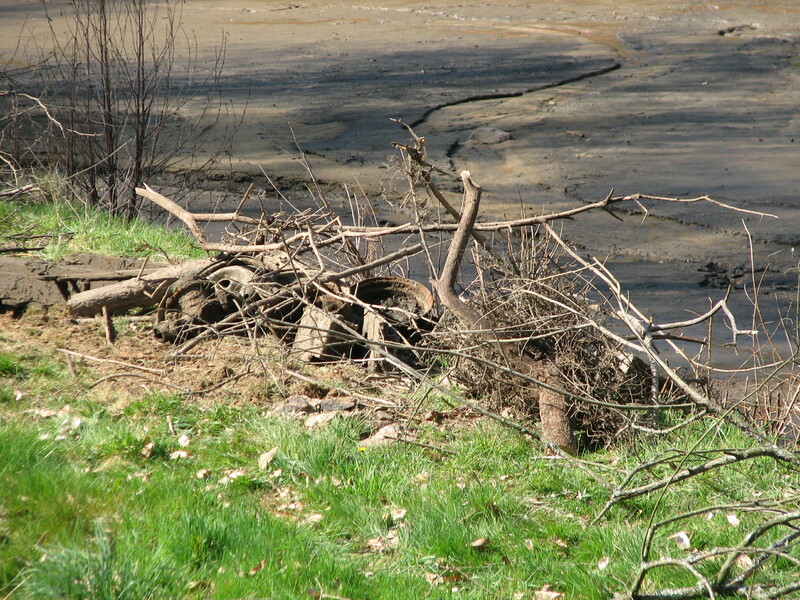 Jean Pierre explained to us to leave all the wood and debris we cleared from the lake on the bank. He would then collect it all with his tractor and trailer. What a star he is!!!! So, so helpful. 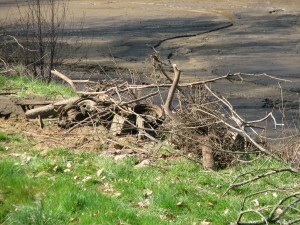 He also thanked me on the decision to leave the small fallen tree in the lake. Not that it was his problem to move it. The branches provided a safe haven for the fish and a good spot just to the left for catching. 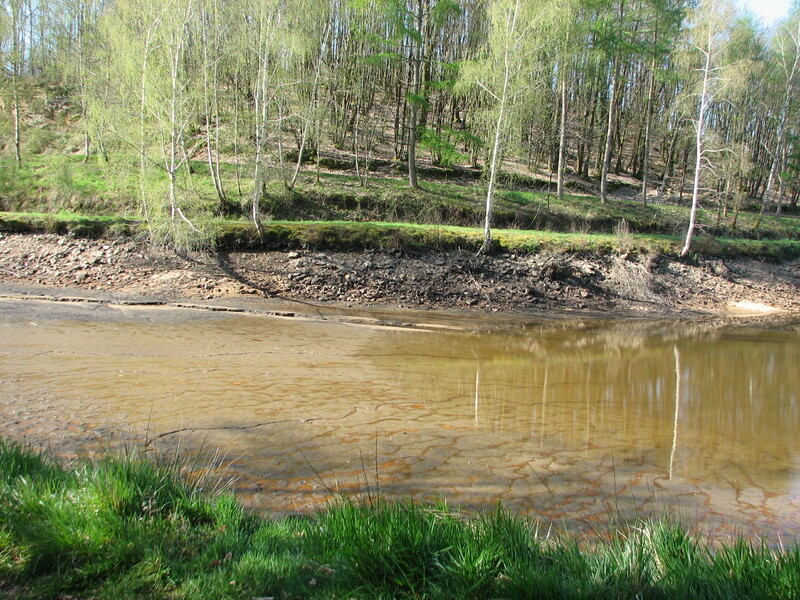 I had caught quite a few fish from this spot when Tom and I fished Le Coly previously. Donald arrived just as we were finishing our conversation, he couldn’t believe how we all understood what we were doing considering our respective language abilities!!!! Donald confirmed that we could expect the final signing on or around 24 May. Tom asked Donald if he was staying to help?? Apart from his reaction of a free coffee I’ve never seen Donald move so fast, bless him!!! Donald was off to see an urgent client??!! Tom and I started where we left yesterday. 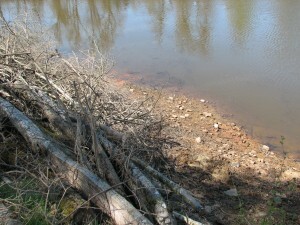 Clearing the rest of the banks. The water level had already risen by a meter from yesterday’s level. There were two large pieces of granite at the entrance end of Le Coly. These had to be pushed over at some point as they formed a hazard to fishing. We spent the next 2 hours clearing roots and branches from the banks and lake bed. 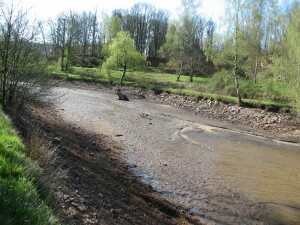 Leaving all the debris on the bank for Jean Pierre to collect later. Tom came over to see me. 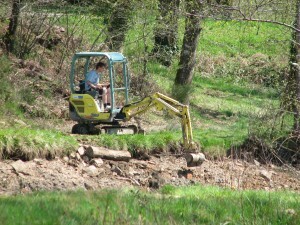 He had finished his side of the lake at it was time to for a determined effort to sort the digger. It had annoyed Tom and I so much seeing it just sitting there all morning. Tom suggested that he could move the bucket very gently to the left to inch it around to the side. This would allow us to put the track back on once the digger was tilted using the bucket. I honestly had my doubts. Not on Tom’s ability but I didn’t think the digger wasn’t stable enough for the bucket to be moved at all. I thought as soon as the bucket was moved it would slip down the granite damaging the exposed back cog. But we had to give it a go!!!!! 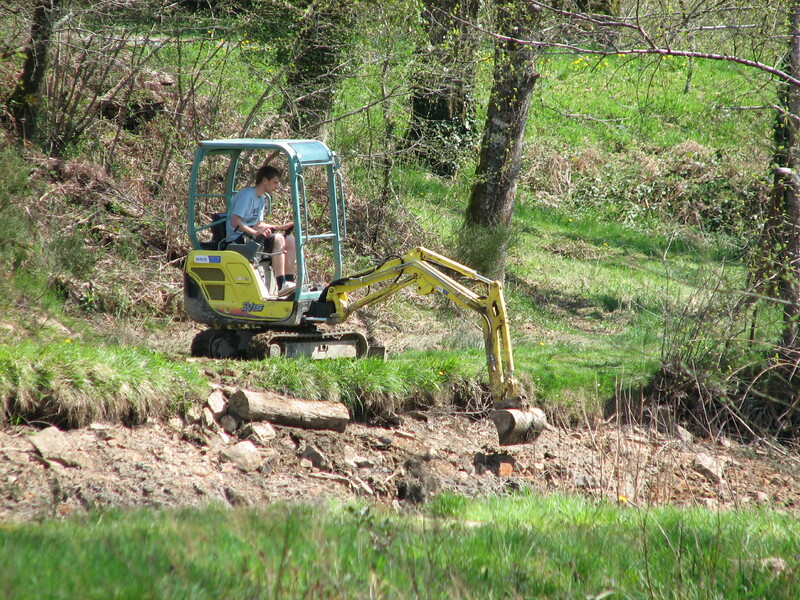 Slowly Tom moved the bucket and he managed to gently tilt the digger from the right side. Michel and I levered the track back on. High fives all round, again I could have kissed everyone. Jean Pierre attached the chain to the digger from his tractor for another pull. At this stage I walked around the corner. I know it sounds pathetic but I couldn’t watch. Within 2 minutes the digger was off the granite and on the bank and upright with both tracks still on!!! How pleased we all were. Hearty hand-shakes all round and a hug for Jean Pierre from me, not sure how he took this but I couldn’t help myself. I know I have mentioned this before, please check the lake bed thoroughly before putting any kind of machine on it!!!! I should have known better as I have helped with this kind of work before and I remember how cautious the lake owner was previously. A huge “school boy” error but we certainly will not be doing that again and yes we have learnt by our mistake!!!!! Back from lunch and enthused by our earlier success we had the remaining banks to clear. All finished in a couple of hours. I thought this would take us at least a week but all done in 2 days. Tom repaired the bank and cleared as much silt as possible with the digger. Of course from the top of the bank and not from in the lake. Tom also managed to topple the granite stack but bent Jean Pierre’s lever bar and put a whole in his waders doing it!!! But the best day so far this week!!!! Tom repairing the bank from outside the lake!!!! Debris from the bed and banks of Le Coly. We must decide on the logo for the web site tonight. Also Tom and I had arranged to visit Mark Beldom and Jean-Noël Retailleau at Freedom Lakes on Thursday as the weather forecast was very wet and cold. We feel it is always good idea to meet other lake owners and if possible to see their lakes. It gives Tom and I chance to share our experiences and ideas, and to see and hear theirs. Also Freedom is one of the top fisheries and both of these guys are very experienced. It is approximately an hour and a half’s drive away so it will give us a chance to see some of the area.